Every day, law enforcement agencies add female officers. Like many other male-dominated fields, gender disparity has been found in most law enforcement agencies across the United States. However, women’s entrance into the field has been progression over centuries. In 1838, the first US police department was established in Boston, Mass. 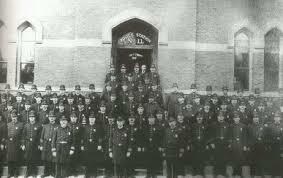 ; however, the first woman “patrolman” was hired in Chicago in 1893. Despite her title, the position carried more of a social worker’s role. She worked with women and children and did not patrol. The Los Angeles Police Department hired the first “policewoman,” Alice Wells, in 1910. While her duties were limited, in 1915, she created the International Association of Women Police that continues today to provide mentoring and education to female officers. Women became much more prominent during World War II. However, in the 1970s, federal records show that only two percent of women made up the police workforce. Since that time, women officers at times make up to 25 percent of some law enforcement agencies, both federal and local. However, the national average lingers at about 15 percent, according to the Bureau of Justice Statistics. Whether or not women are the solution for issues that American society faces in policing today is debatable. However, the evidence is clear that female officers are rising in numbers and rank in our law enforcement. Time has shown, that women will continue to break the barriers that once held them back from excelling in their field.